Right away, isometrics strip away the fluff and get down to the essential. This is Steve's most minimal program yet. Do not confuse minimalism with a lack of effectiveness. Like plutonium, more is rarely better -- better is better. The Functional Isometrics video runs approximately 31 minutes and is a 976MB download. Steve's Functional Isometrics videos require QuickTime Player. 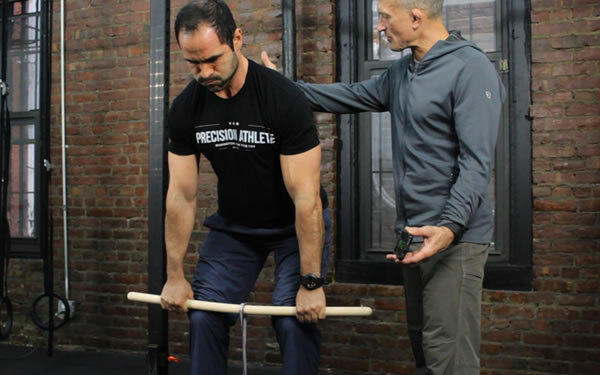 Steve's Functional Isometrics video goes hand-in-hand with his Advanced Isometrics video. With isometrics, the form is no-brainer: because there's no movement, it's that much harder to do wrong. While you might still slack on the effort, it's hard to screw up the technique! This isometric video is very freeing -- you no longer need rely upon ANY equipment, other than a simple belt or cord. Never again be without your workout! The yielding isometric, wherein you hold a measurable weight (in this case, your body weight) for time. Ex. holding the top position of a chin-up. The other type of isometric shown is the overcoming isometric, wherein you push against an immoveable object, for time. In this type, the resistance is self-generated, that is, other than your own muscular fatigue, there's no way to measure the amount of work done -- but that does not reduce the effectiveness for either strength or hypertrophy! Don't be fooled by the brevity of the program -- it's very potent. I recommend following this routine no more than two times per week. Like any strong medicine, increasing the dose is a bad idea. Some may be skeptical about the results, i.e., the carryover of isometric training to full-range exercise, and in fact when I began my own experiments with it, I was also dubious. Yet, after having done almost exactly the same sequence as shown in this video for 8 weeks, at the age of 63, I matched my former PR on pull-ups -- a number I hadn't attained since my 30's. Steve recommends a constructive workout of no more than 12 exercises. Pick a movement for each body part. Be sure to balance a push with a pull, both horizontal and vertical. Feel free to add isolation movements to body parts you are particularly interested in developing. Steve likes to mix mult-joint exercises with isolation movements, sometimes using the pre-exhaustion method. You can also follow the demonstration workouts at the end. As always with your products, this is great information. Would you recommend a day of one-arm pushup practice with some pull-ups during the week with 1-2 days of the isometrics? It's not so simple to reply because it sounds like you might have some confusion about goals. The breadth of your question requires a phone consultation (scroll down). There is no pat answer but I'm happy to assist you with an individualized program for your potentially conflicting goals. I am interested in your isometric video. Is this a follow-along or an instructional video? I do love the support and encouragement that a follow-along provides. It's not strictly a follow-along workout, but the instructional parts are pretty well-laid out. This might be an odd question but what brand of trousers are you wearing in your new isometrics video? Kuhl brand Renegade jean. Other pants I'm into: any of the Kuhl Renegade jeans or Renegade regular pants also Prana brand stretch Zion shorts and stretch Zion pants are right on, right now. Do you breathe or hold your breath when performing Functional Isometrics. Many, many small breaths. If you hold the breath you could risk heart attack or stroke. Isometrics training offers an excellent lesson in breathing through tension. I'm doing "your future workout". Are there rest periods during the workout or is it back to back all the way through? I assume all intervals are 1 minute except Hindu push-up. Is that correct ? How many times a week do I do this workout? I like to go back-to-back. I really enjoy the cardio-respiratory benefits of low-rest workouts. It increases the intensity in a way that's pleasing to me. It's HARD but I like to work out hard, you know? 1-minute intervals are about the time it takes to get the results, but I like to go to fatigue instead of arbitrary time or reps. The true goal of exercise it to produce deep-level fatigue. Instead of increasing time or reps ad infinitum strive for increasing intensity -- that is making the exercise harder -- and perfecting the form. I just viewed Steve's video download. This is a cleanly shot, clearly taught and concise piece of work. Basically Steve takes all those isometric courses we collected on our bookshelf over the years.. pulled ideas from his lifelong study of grappling, then added Maxwell ingenuity. It's enjoyable to watch and doesn't waste a second on hype. All meat, no fat. I can tell you that I'll be adding some of these drills to my workout. It's not magical techniques or stupid variations made up for novelty sake. It's a group of drills that you forgot and Steve simply organized and made clear in his own unique style. This download is a great investment for the road warrior who wants something during his travels to keep his strength at a high level. It's also a great idea for any athlete with weak areas or compromised movement during mild injury.